Deborah K. Jones is a retired career member of the Senior Foreign Service. She retired from the U.S. Department of State in November 2016 with the rank of Career Minister following 34 years of service. Her last assignment was as Deputy Commandant/International Affairs Advisor at the Dwight D. Eisenhower School for National Security and Resource Strategy (formerly ICAF) of the National Defense University from October 2015 to November 2016. Prior to that assignment, she served as United States Ambassador to Libya. Ambassador Jones currently chairs the board of the Hollings Center for International Dialog and participates on the Atlantic Council’s ad hoc Gulf Security Advisory Board. Prior to her service in Libya, Jones served for eight months as Scholar-in-Residence at the Middle East Institute. She has also served as Ambassador to the State of Kuwait, Principal Officer at the U.S. Consulate General in Istanbul, Turkey, and Senior Faculty Adviser for National Security Affairs at the U.S. Naval War College in Newport, Rhode Island. She has filled other oversees assignments in Argentina, Iraq, Tunisia, Syria, Ethiopia, and the United Arab Emirates. 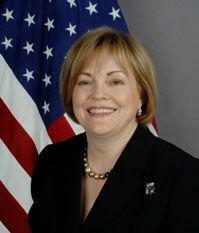 She has filled other assignments with the State Department in Washington, D.C., including Secretariat’s Seventh Floor Operations Center, Staff Assistant to the Assistant Secretary for Near East and South Asian Affairs, Acting Public Affairs Adviser to the Assistant Secretary for Near East Affairs, Jordan Desk Officer, Director of the Office of Arabian Peninsula Affairs and Iran, and the Board of Examiners. She has received multiple Department senior performance awards, including several Superior Honor Awards, and was nominated for a Presidential Honor Award in 2014. Jones was decorated by the UAE’s Minister of State for Foreign Affairs with the sash of the “Order of Independence” in 2002. Jones was raised in New Mexico and earned a BA in history from Brigham Young University. She then earned an MS in National Security Strategy from the National War College of the National Defense University. She studied Arabic at the Foreign Service Institute in Roslyn, Virginia, and at the State Department’s Field School in Tunis, Tunisia. She is married to Richard G. Olson, U.S. Foreign Service Officer and former Ambassador to Pakistan. They have two daughters. This page was last edited on 1 February 2019, at 12:26.